It turns out that printing on SIM cards is a challenge! This is perhaps the simplest and cheapest and means using a coloured ribbon and a thermal transfer head to transfer some of the colour to the card using die sublimation. This is the same trick used by some photo printers and typically allows good quality 300 dpi with 256 levels of each of Cyan, Magenta, and Yellow. For photo printing the Black is often done the same way, but interestingly for printing plastic card the black us usually a resin of some sort that is either on the card or not (1 bit per pixel printing) at the same resolution. CMY allows full photo colour printing, but the solid resin black creates a really crisp and sharp black text on a card. This technique works well but is never quite 100% edge to edge. Some are better than others at getting to the edge. This also only really works when you have the standard, good quality, smooth, plastic card stock. It is great for ID cards and the like with a very slight white border. Retransfer printers are different. I have seen some samples from at least three different makes of retransfer printer now, and they are not all the same. The way this works is there is a transfer film, slightly wider than a card, and you use the same printing technique using CMYK ribbon as above to print on to the transfer ribbon. Then, using heat and pressure, you transfer that print on to the surface of the card. This allows edge to edge - the artwork is actually slight bigger to allow for alignment of the card. SIM cards pose at least two problems for printing. Well, more than two really, but the main two are that the material is not perfect. It is not a smooth plastic, but typically slightly textured. It also has an area where the chip is located that is not quite flat. It also has more of an issue with "over the edge" printing than normal as it will have a cut out, or more than one, for the SIM. It also has an area of electrical contacts. Finally, it may have some printing already (hard work to get supplier to provide truly blank cards!). The Zebra ZXP 8 we use allows for this to some extent using an "Inhibit" panel on the ribbon. What this does is pulls the transfer material off its ribbon leaving a gap. You use this over the cut edges and the contacts. Sadly the alignment is not perfect so you have to have an unprinted area over the edges. If you don't use the inhibit then you get a cellophane type material in the air gap and on the contacts. It does wipe off, but sticks to everything, and is a mess. So you have to use inhibit. However, two other makes of printer we have tried has no such issue, and the cut out in the card is simply, well, not printed! The contacts end up clean and unprinted too. This is much nicer and avoids alignment issues. The inhibit can also tear the ribbon which is a pain in the arse. The other issue of the material itself not being smooth is that you need pressure and heat to transfer. The SIM cards we use are not under our control. They are provided by the big SIM card makers but are different materials, and we find the data SIMs are the worst. In fact, in the Zebra ZXP 8, we have found we need near max temperature to make it work, and that quickly (in a few cards) buggers the transfer rollers. A lower temperature and speed is the only way we have managed so far. The other big issue is that too much heat causes the card itself to warp and bend. We are at the end of our patience with the Zebra, sorry, and looking to others. They are really good for plain plastic cards but not good enough for SIMs. So we tried DataCard. They are nice, but cannot go hot/slow enough to work with the data SIM cards. Again, love on plan white card stock, and actually nice on the material that makes our voice SIM cards, but not up to doing the data SIM cards. Shame. I am pleased to say that the samples I got today are stunning, and we'll get a proper demo next week. A new printer which is working on data and voice SIM cards nicely, has no cellophane effect and so needs no inhibit, and is even 600 dpi print. I'll post more in a week or two once we have one, and I have sorted linux drivers. We'll upgrade the web site for card ordering for 600 dpi images. We offer card printing now, mainly for ID cards for schools and the like, but if these printers can maintain this quality we'll expand on that and confidently offer bulk SIM card printing. P.S. Even something as simple as card printing has nanny state legislation which is totally pointless. The Specialist Printing Equipment and Materials (Offences) Act 2015 makes it an offence to sell printing equipment to people knowing it will be used for illegal purposes - but how would any supplier know. It does not even say that suppliers have to ask. What a pointless law. Update: Those samples turn out to be only 300dpi. The 600dpi version is not coping with the SIM cards quite as well. Even so, they look damn good. Why are data SIMs different? They're all just a SIM, the distinction between voice and data is totally artificial as far as the mechanics of a SIM card is concerned. 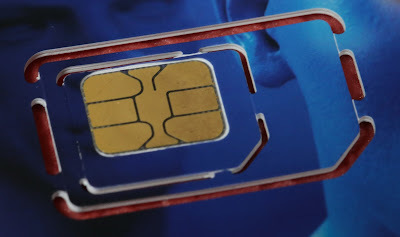 Different plastic, different surface texture, different SIM manufacturer. Is this duff law aimed at printing fraudulent identity documents? Or 3D printing of guns? Perhaps a moral panic about that. ID, travel and entry documents, not 3D at all. And it seems well covered by aiding and abetting laws anyway. Why do you need to use different SIM cards for data and voice? Isn't a sim a sim? Different networks, different SIM manufacturers. Even when we have the APN through to our GGSN on the voice SIMs they will still be a different network to the data only SIMs. Hi, Did you ever come to any conclusion regarding what printer to use for printing on SIM-cards? Yes, a Matica printer. Still going strong and very good quality and reliable. What model are you using to print on SIM-cards? Getting a refund out of Apple!